What does it say about the state of online advertising that businesses remain crazy to use Groupon at extremely high costs? Groupon, as you know, is a deal-of-the-day network that has achieved phenomenal success since its launch in November 2008. It has scaled rapidly to 35 million registered users (partly through acquisitions of various couponing sites) and according to The Wall Street Journal may get to $1 billion in sales faster than any other company in history. The secret, often reported but not-oft remarked upon, is Groupon’s model. The site takes a whopping 50% of all revenue resulting from the business promotion — not X dollars per impression, or even Y% of margin, but half of all the money you make. And businesses don’t seem to question it — according to Groupon itself, companies are lining up to get in its window, and Groupon turns down more applications than it accepts. Yowza. No wonder Groupon is rolling in the dough. 1. Going viral is almost impossible unless you game the system. If you use Groupon, you’re getting gouged as the price for going viral — meaning that lofty success, dreamed of by every marketer who’s uploaded a clever clip to YouTube, is in very short supply. Yes, we all remember Subservient Chicken or last year’s Old Spice dude, which got millions of web hits. But most campaigns never strike a chord in the masses to be passed along; it’s almost completely random that a guy does The Evolution of Dance for fame, and once a concept trends, it rarely can be repeated. Groupon takes advantage of this failing in today’s communications networks by allowing companies to pay to reach thousands of people. It has brilliantly gamed the impossibility of viral marketing by creating a mass audience that can be reached, for a sharp rev share. 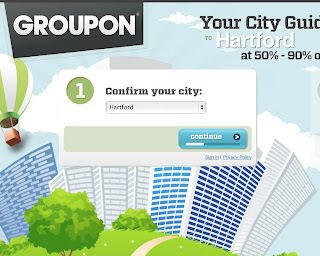 Groupon is the viral equivalent of Google’s “sponsored link” ads — you can be at the top, but only if you pay. 2. Virality, if achieved, is fleeting. The very nature of “deal of the day” is that the deal changes. Groupon knows consumers rush for the new-new thing, and then want something else, which works brilliantly for its coffers but not so good for its business clients. You might try Groupon once for a pop, say, launching a new coffeeshop in downtown San Francisco, but you’d never use Groupon as a sustainable marketing initiative. How could you, giving away 50% of your revenue in addition to the coupon value on top of it, just to get foot traffic? 3. Mass audiences win, even in the age of social media. Groupon’s core value is its near-guarantee of delivering your promotion to a mass audience (we mentioned 35 million registered users). Sure, it’s an assurance contract, where you only give it away if enough people sign up, but that creates momentum for the participants who want you to get more mass behind them. Gurus can talk about small communities and engaged individuals all they want, but Groupon shows what businesses really love is a large throng rushing their doors. We mean Groupon no harm: 50% revenue for being smart and filling a market need? Bully for you. There is some value here because advertising online has become more challenging, with consumers awash in display ads (about 90% of all banner ad space goes unsold) and moving to smaller screen formats (iPhones, tablets) that reduce visual inventory for marketing intrusions. Groupon is riding this wave of despair with a surefire model to reach the masses. It works, but only for a quick pop, and only if you’re willing to give most of your money away. The question for Groupon is whether its king-of-online-coupon model is sustainable, even with a crack localized sales force. Google is fast upon its heels, and we can imagine the Amazons (see: LivingSocial) and eBays of the world easily finding a way to replicate the lure of discounts to the masses. In the end, competing on price is a feature and not a competitive advantage; and those pesky audiences that drive all the attention have a way of moving on.